At PM Academy we believe that assessing the maturity of your project is the first step in improving the infrastructure surrounding project management in your organisation. Mutual agreement will be reached on the Communication & Quality Control Processes & Requirements & the format of the assessment deliverables. The requisite arrangements for interviews with identified client resources will be agreed & diarised with the target audience. The resources shall comprise stakeholders that direct, lead, manage & operate the project management environment at the client. The scope is documented in a Project Initiation Document or Project Charter. Contracts are prepared & signed. A sample portfolio of 3-4 representative Project & Programme Management documents are reviewed in order to gain a clear understanding of the adherence to current Project Management Practices. Portfolio documentation is also submitted when applicable. With the prior approval of the client, maturity questionnaires will be distributed to the nominated Project Management interviewees to enable us to obtain maturity feedback prior to the interviews. This approach minimises the time taken for interviews. Our team of Project Management Professionals conduct interviews with the client Project, Programme & Portfolio Managers. The results are recorded for later analysis. The Quantitative & Qualitative Data gathering shall be captured, analysed & interpreted by our Project Management Professionals. The overall client Maturity Level compared to a relevant industry benchmark. The Draft Portfolio, Programme, Project Management Maturity Assessment Report is discussed with the client to confirm relevance, accuracy & agreement on the road forward. The Portfolio, Programme, Project Management Maturity Assessment Report & associated PowerPoint presentation is formally handed to the client management & the Project is formally closed. On completion of the initial Maturity Assessment, we also offer our services to work closely with our clients to ensure that the recommendations are implemented effectively. We can furthermore assist with development & implementation of Portfolio, Programme & Project Management Governance. Working in partnership with you & your team leveraging our collective assets & knowledge ensures maturity advancement within the organisation. PMMA provides a framework for PM Academy to re-assess the Project Management Practices of the organisation 6 months to a year after the initial assessment, resulting in measures of success in the continuous cycle of Project Management. Research by the Self Empowerment International (SEI) has shown significant improvements in the return on investment rate in organisations adopting a Maturity Model Approach to progress, with the average rate exceeding 4:1. More mature organisations have experienced an 85% reduction in defects & a 75% reduction in cost. Although the SEI’s maturity models were originally specific to software engineering, they are now widely used for process improvement generally. Organisations can now benefit from achieving Organisational Project Management Maturity. Developed under the stewardship of PMI, OPM3® is an acronym for the Organisational Project Management Maturity Model (PMMM) & has established itself as a flagship management tool in driving up standards & capability in Portfolio, Project & Programme Managemen & in improving performance & quality. The Project Management Institute’s OPM3® Standard emphasises the value of Organisational Project Management in the delivery of Organisational Strategies. The OPM3® Standard is aligned with the new PMBOK® Guide 4th Edition & the updated Program & Portfolio Management Standards (2nd Edition). Benchmark Ability to gain insight into Peer Organisations Maturity Continuum scores & Best Practices, achieved with average, mean & median Reports. It is important for organisations to understand the optimal level of performance in their quest to maximise value for money from investment & to have a realistic view of what they can achieve. Not all organisations will be able to reach the highest level & for many, the middle levels may be adequate to meet their business needs & aspirations. Organisations that have focused only on training, specific methods or tools, or a governance framework, often wonder why they have not seen the promised improvements. OPM3® offers a more holistic view of an organisation’s performance, using a broad spread of attributes. To gain the maximum benefit from using OPM3®, Performance Improvement should be seen as a long-term process, although it is possible to achieve short-term performance gains by using OPM3® to identify & correct performance weaknesses. Our experience & in-depth research have identified the essential best practices from OPM3® that will help advance your Organisational Maturity. Once an organisation reaches its highest maturity level, it has adopted a Project Management culture able to significantly optimise efficiency, sales & profitability. Most organisations have strengths in some areas but not in others. 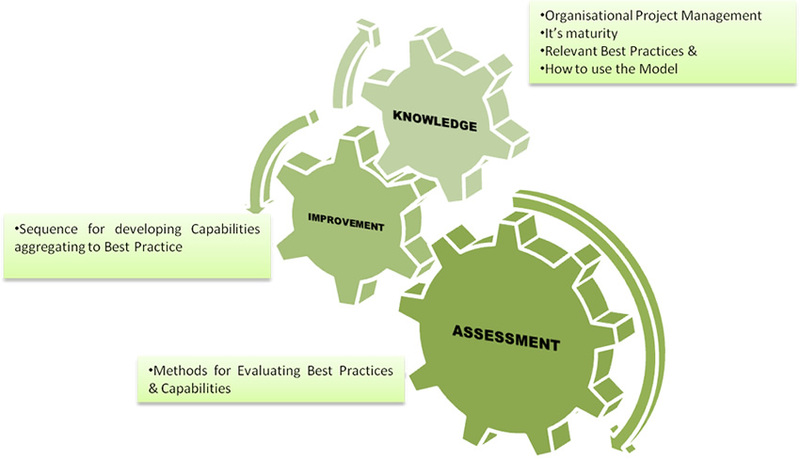 P3M3 focuses on the following 7 Process Perspectives, which exist in all three models & can be assessed at all 5 Maturity Levels. The flexibility of P3M3® allows organisations to review all 7 Process Perspectives across all 3 models – Portfolio, Programme & Project Management, but they can also review just one model, e.g. Project Management Maturity. questions you may have about our courses.